From April 27 through May 6, ISTP spacecraft and observatories got a sample of what is to come during the maximum of the solar cycle. In the span of 10 days, the Sun produced seven coronal mass ejections, two X-class flares (the most energetic type), and at least two energetic particle events. At Earth, several major magnetic storms upset several spacecraft, brought auroras to lower-than-normal latitudes, and forced power companies to reconfigure the grid in New England. 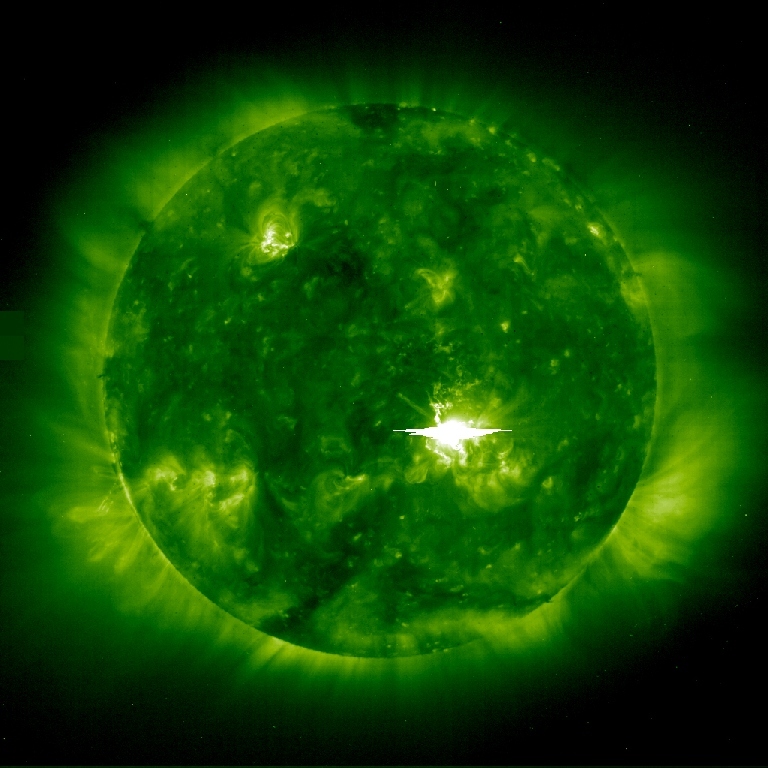 On April 29, a "halo" CME left the Sun and its shock arrived at the SOHO spacecraft within 53 hours. The shock arrived faster than any other detected so far by SOHO. A magnetic storm followed on May 2. Contrary to rumors and anecdotal reports, the failure of the Equator-S satellite was not necessarily a result of CME or magnetic storm. ISTP observers have noted that sunspots are becoming more complex and moving with a clockwise rotation--telltale properties of proton flare sunspots. On May 1-2, ISTP observed two halo CMEs, as well as an X-class flare. High-energy protons from the flare arrived at SOHO within 30 minutes, and a major magnetic storm developed on May 4. During the storm, the disturbance storm-time index (Dst) reached -218 on the scale of 0 to -220. It is the largest storm of the current solar cycle. An ISTP ground station (CANOPUS) measured electric currents in the ionosphere well above 2000 nanotesla, about 3-4 times the norm for solar minimum. The January 1997 event that knocked out Telstar 401 had currents of 1800 nT. In response to the magnetic storm, power companies in New England reduced their power sharing capacity with Canadian utilities. Auroras were reported as far south as Boston and Chicago. May 6 also was an extremely active day: ISTP observatories detected a slow CME, a moderate-speed halo CME, and a fast CME, though none led to magnetic storms. However, an X-class flare burst from the Sun, raining high-energy protons toward Earth. The protons upset the Polar spacecraft, forcing controllers to shut it down for several hours. All of the instruments and electronics have since been restored.